Apollo-era flight controllers gathered at Ellington Airport in Houston to be among the first to see NASA's newly-restored Mission Control consoles on Thursday, Nov. 8, 2018. The 50-year-old hardware was delivered from the Cosmosphere in Kansas onboard NASA's Super Guppy cargo aircraft. HOUSTON — NASA's efforts to restore its Apollo-era Mission Control has given new meaning to "We're go, Flight!" The call, which 50 years ago was in reference to the flight director at the head of the Mission Operations Control Room (MOCR), could now also apply to the newly-refurbished consoles that returned to Houston on Wednesday (Nov. 7), by way of NASA's Super Guppy cargo aircraft. The delivery, from a restoration facility in Kansas, marked the first time that the ground control hardware had taken flight. On Thursday, 10 of the push-button and screen-lined cabinets were unloaded from the bulbous-nosed aircraft at Ellington Airport, not far from Johnson Space Center, after spending the past 10 months being cleaned, repaired and equipped with new internal electronics. 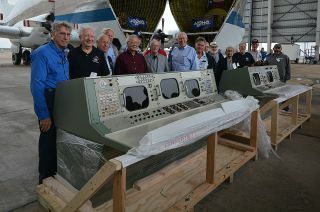 "We are celebrating the arrival of the first group of restored consoles from the Cosmosphere in Hutchinson, Kansas. Truly, these consoles represent the crown jewel and centerpiece of our restoration efforts," said Jim Thornton, manager of NASA's Apollo Mission Control restoration project. Apollo-era Flight Activities Officer (FAO) Spencer Gardner inspects the restored Capsule Communicator (CapCom) console at Ellington Airport in Houston on Nov. 8, 2018. "It is a great opportunity to honor our legacy," added Thornton. "We are coming up on the 50th anniversary, the golden anniversary of the Apollo 11 moon landing, and we want to return this National Historic Landmark to the glory of those days and preserve it for the generations to come." A group of Apollo flight controllers, including flight director Glynn Lunney, INCO (Instrumentation and Communications Officer) Ed Fendell, EECOM (Electrical, Environmental and Consumables Manager) Bill Moon and electrical power systems controller Jim Kelly, were on hand at Ellington to get a first look at their former work desks. As conservators from the Cosmosphere's SpaceWorks restoration division unwrapped the CapCom (Capsule Communicator) and Flight Surgeon stations, the retirees crowded around to inspect them. "They are beautiful," said Lunney in an interview with collectSPACE.com. "I didn't appreciate at the time [of the Apollo missions] the color. I didn't remember that we had tones of green, but lo and behold we did. It looks very nice." Lunney said he did not expect to feel as he did seeing the consoles revealed. "I must admit, I didn't have the same outlook coming in here," he said. "I thought it was going to be a routine thing, but just standing around looking at the consoles with the guys who were there was a very wholesome feeling. It really felt good — more than I thought it would feel coming in today." NASA is hoping the public has a similar reaction. "The Apollo program, and more importantly the men and women who made it happen,& should be remembered for the historic accomplishments they made," said Mark Geyer, director of the Johnson Space Center. "It's terrific that we're restoring the Apollo MOCR to that time, back to the Apollo time, so people can see it. Let it be a fitting reminder of that historic time." EECOM (Electrical, Environmental and Consumables Manager) Bill Moon joins other Apollo-era flight controllers checking out the newly restored Mission Control consoles on Nov. 8, 2018. The consoles were to be loaded onto trucks for the short trip to Johnson, where they will be held in temporary storage as work inside the MOCR is completed. Meanwhile, a second set of consoles will be trucked to the Cosmosphere for their similar restoration. "If you could see the room today, the ceiling has been ripped out, the last two rows of consoles are still there but they're going to be removed and sent to Kansas for restoration, and then we will slowly start building the room back up," Thornton told collectSPACE.com. "We will reinstall the lighting in the ceiling and then we will work on the wallpaper, get the carpet installed and then we will reintroduce the consoles." "All of this will take us up to June or July to get everything done," he said. NASA and Space Center Houston, the visitor center for Johnson Space Center, is planning to debut the fully-restored Mission Control in July 2019 as the highlight of a month-long "Defying Gravity" celebration. The general public will be able to visit the room to experience what it was like on July 20, 1969. "We have things like this so that people know what was done and come to appreciate and learn from it," said Lunney. "What could people learn from the fact that a bunch of guys got together and landed another bunch of guys on the moon? I mean, that is really something." See more photos from the Super Guppy delivery of NASA's restored Mission Control consoles at collectSPACE. Follow collectSPACE.com or Facebook and on Twitter at @collectSPACE. Copyright 2018 collectSPACE.com. All rights reserved.